Privacy Badger has replaced this Vimeo button. Use skill analytics to analyze, measure, and improve your team's learning on Pluralsight. This report presents a collection of data from skill assessments taken by individuals on your team. Skill IQ allows you to gain insight into the proficiency levels of your team and gauge them against industry benchmarks using a percentile. 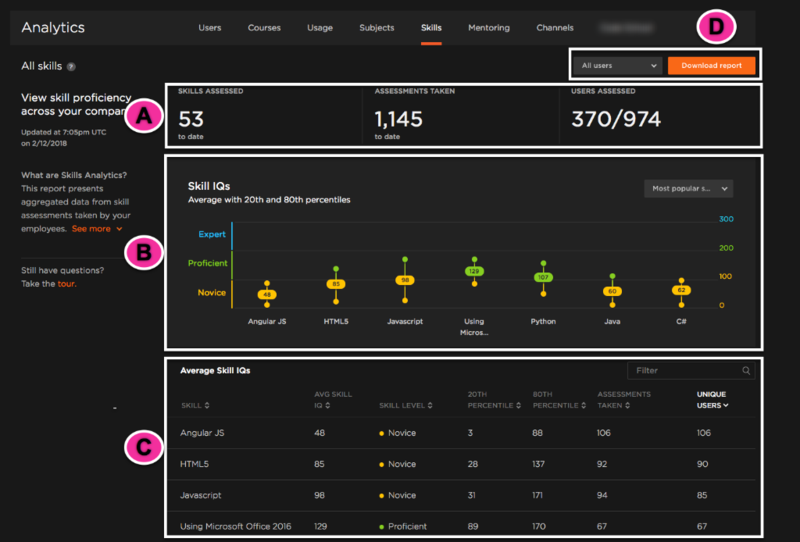 Skill assessments measure your teams' skills across Pluralsight. An individual on your team can pick a skill and take an assessment. These assessments are collected using our in-house algorithm and skill assessment recommendation tool, Iris. Iris will take this information and determine a Skill IQ for your team members. This Skill IQ is a quantifiable skill level based on a percentile rating for a skill and is weighed against others in the industry. Take a peek at our articles on Iris and Skill IQ to learn more. To get started, log in to your Pluralsight account and click the Analytics link in the left pane navigation menu. Next, click the Skills link at the top of the Analytics page. Analytics dashboards are updated hourly. Important: 5 unique learner scores are required to show your team's Skill IQ data for a given skill. This helps to protect the personal information of the learners on your team. A. The first section gives a broad overview of your team's skills and usage. You can see the skills assessed, the number of assessments taken, and the number of users assessed compared to the total number of users on team. B. The second section highlights the Skill IQs for your team. Skill levels are broken up into Novice, Proficient, and Expert. To determine these skill levels, individuals on your team can take a skill assessment. To take a closer look at how your team is doing, you can click on a skill title and corresponding Skill IQ number. Using the drop-down menu, you can sort your team by most popular skills, strongest skills, and weakest skills. C. In the Average Skill IQ section, you can view the skill title, average Skill IQ, skill level, 20th percentile (average), 80th percentile (average), number of assessments taken, and unique users for each skill. These can be sorted from highest to lowest values or alphabetically by skill. This information is also found in the report download, explained below. D. To download a report of your team's skills data, click the Download Report icon. This will automatically download a CSV file for your team and will include the information found in the Average Skill IQ section. The Skills Analytics report is updated in real-time for all active users on your plan. By default, the report is downloaded in a CSV file format and reflects the information found in the Average Skill IQs section. The filters applied to the dashboard will also be applied to the data in the downloaded report. A. Skill: This will show the skills that have been measured by learners on your team. If a skill has not been taken, it will not show in this report. B. Avg Skill Rating: This represents the average percentile of your team. This number is determined by taking all the results of your team and averaging them. This view gives a great overview of your team as they relate to a skill. C. 20th Percentile: The average range within the 20th percentile. This is a helpful metric to identify areas for improvement. D. 80th Percentile: The average range within the 80th percentile. Use this to see where your team is excelling. E. Assessments Taken: The number of total assessments taken within your group. F. Unique Users: The included learners on your team that have taken a particular skill assessment. Question: How long does it take for skill measurements to show on a report download? Report downloads are in real-time. The skill analytics pages are updated hourly. For more information on how other analytics reports populate, see our article on data population. Question: If I join a team, is my usage data carried over from my individual plan? It depends. If you have an individual Pluralsight plan and are invited to an Enterprise or Professional plan, you must use the same email address as your individual plan when accepting the invitation. If you accept under a different email address, your progress won't carry over. Question: Can my learners retake an assessment? Yes! Learn how to re-measure a Skill IQ. Question: Can I get the actual score for learners that have taken an assessment? If you are on an Enterprise plan you have access to the individual report view. This view gives you the skill level (Novice, Proficient, Expert) of the individual, but does not allow you to see the actual score. More information can be found in our getting started with advanced skills analytics article. Question: Can I use Skill IQs for hiring, firing, and promotion decisions? If a user has been issued a business Pluralsight license and has activated that license, a business may choose to use their Skill IQ and Role IQ levels in decision making. If a user does not have a paid and activated Pluralsight license, they may sign up for a free personal account and choose to share their Skill IQ and Role IQ with their current or prospective employer. If you are an Enterprise Plan customer, learn about advanced skills analytics, which gives you more granular details for individuals within your team.